President of Ukraine Petro Poroshenko during the 73rd session of the UN General Assembly met with his Turkish counterpart Recep Tayyip Erdoğan, informes the press service of Ukrainian President. 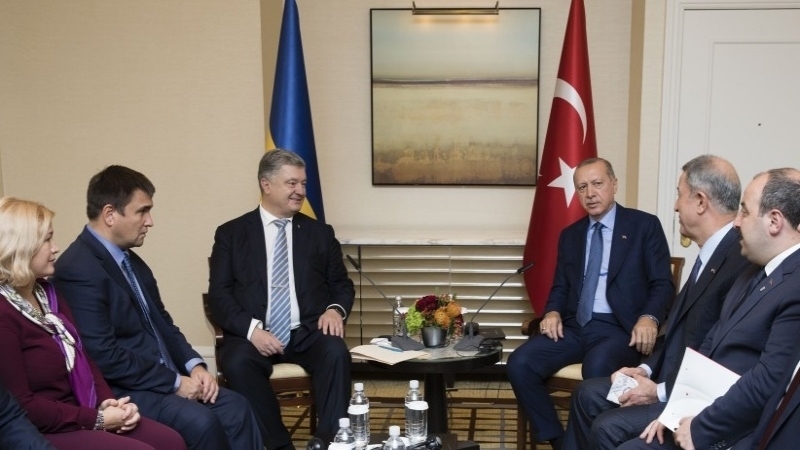 Poroshenko called on Erdoğan to assist in releasing of Ukrainian citizens - political prisoners of the Kremlin. “A strong signal was received from the Turkish side about their steadfast position towards the support of the territorial integrity of Ukraine and the non-recognition of Russian occupation of the Autonomus Republic of Crimea, and focus on further assert upon rights of the Crimean Tatar people,” says the message. Both leaders stressed the importance of final preparations for implimination of Free Trade Agreement between Ukraine and Turkey and decided to hold the next Ukraine-Turkey High-Level Strategic Council meeting and a trilateral meeting in the Ukraine-Turkey-Azerbaijan format. The parties also discussed the prospects for cooperation in trade, economic, investment, medical spheres, and cooperation within the framework of the UN. As QHA reported, Ukraine handed Turkey a list of political prisoners. Earlier, Turkish President Tayyip Erdoğan appealed to the Leader of the Crimean Tatar people Mustafa Dzhemilev with a request to provide him a list of Ukrainian political prisoners in Russian prisons. According to Dzhemilev, the Turkish Leader promised to talk about their release with the president of the Russian Federation. Reference, on October 2017, by the aid of the Turkish president the Deputy heads of the Mejlis of the Crimean Tatar people, Akhtem Chiygoz and Ilmi Umerov, illegally detained by the Russian government, were released and extradited to Turkey.